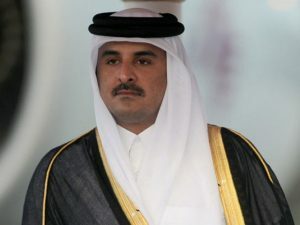 President Emmanuel Macron’s office Monday announced a visit by Emir of Qatar Sheikh Tamim bin Hamad al-Thani, by the end of this summer, as the crisis between the tiny Gulf country and its neighbors lingers on. The French leader, according to his office, held a phone conversation with Sheikh Tamim over the crisis now running for one month. “During this telephone exchange, the Emir said that in view of the situation, he expected to come to France at the end of the summer,” the office said in a statement. Saudi Arabia, the United Arab Emirates (UAE), Bahrain and Egypt severed ties with Doha on June 5 over terrorism funding charges. The Saudi-led bloc also enforced sea, land and air blockades against Qatar, conditioning the lifting by 13 demands handed over to Qatar through Kuwait. Since the beginning of the crisis, President Macron has called for dialogue and offered his mediation to the Gulf neighbors. Written by: KanelkaTagba on July 4, 2017. Posted by KanelkaTagba on Jul 4 2017. Filed under Headlines, World News. You can follow any responses to this entry through the RSS 2.0. Both comments and pings are currently closed.